Allied Artists (formerly Monogram) was a minor studio known for inexpensive action-adventure films like the “Bomba, The Jungle Boy” series. In the mid-fifties Allied wanted to get in on the historical epic boom led by MGM, Warners, and Columbia with a big film of their own, so they rented the English studio MGM used for Robert Taylor’s medieval trilogy, and bought a script about Edward, the Black Prince, and his adventures during the Hundred Years War. 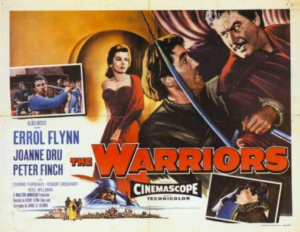 And for their bankable star they hired Errol Flynn, for what would be his last swashbuckler. The film’s reputation is as the last hurrah of a has-been, but really, it’s better than that. Oh, Flynn does look tired in the broadsword fights, and is frequently doubled, but he still has much of the old charm. The story, though conventional, is economically told, and moved right along by director Henry Levin (“The Return of Monte Cristo”). It’s full of fine British actors like Michael Hordern, Peter Finch, and Rupert Davies, the combats are convincing and period appropriate, and the whole thing clocks in at only eighty-five minutes, so no time is wasted. It’s 1359, and after the English under Prince Edward (Flynn) have defeated the French and captured their king at Poitiers, King Edward III returns to England, leaving the Prince behind to rule Aquitaine. But the French, led by the ruthless Comte de Ville (Finch), subvert the peace, and soon Aquitaine is at war again. To draw out Prince Edward, de Ville abducts Lady Joan Holland (Joanne Dru), Edward’s childhood sweetheart. The Prince falls into de Ville’s ambush, and there’s a spirited cavalry skirmish, but Edward escapes the French trap. Separated from his men except for Sir John (Davies), Edward decides to rescue Joan himself by infiltrating de Ville’s castle disguised as a nameless black knight. The story presents this well enough to actually make such a reckless plan believable, and derring-do ensues. The fine castle built for “Ivanhoe” makes another appearance, or rather two, the interiors standing in for de Ville’s medieval château, with the exteriors used as Edward’s castle in the climactic siege. After a couple of tries, Edward manages to rescue Joan and escape to his stronghold, but de Ville has been reinforced by the villainous Bertrand du Guesclin, who wants Edward’s head, so the French have fun storming the castle. Mantlets and bombards are deployed, the English longbow wreaks its havoc on the French chivalry, and the laws of drama are obeyed as the principal antagonists meet in personal combat on the castle walls to resolve their differences the old-fashioned way. It’s pretty good.